Last updated about 2 months ago. 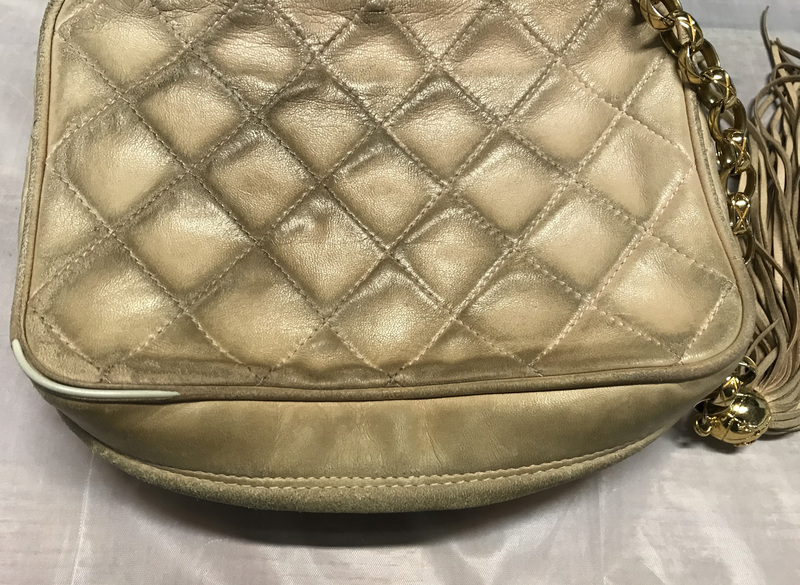 Find Out What We Did To Transform This Vintage Chanel Bag Back To Its Former Glory. A Step By Step Process. 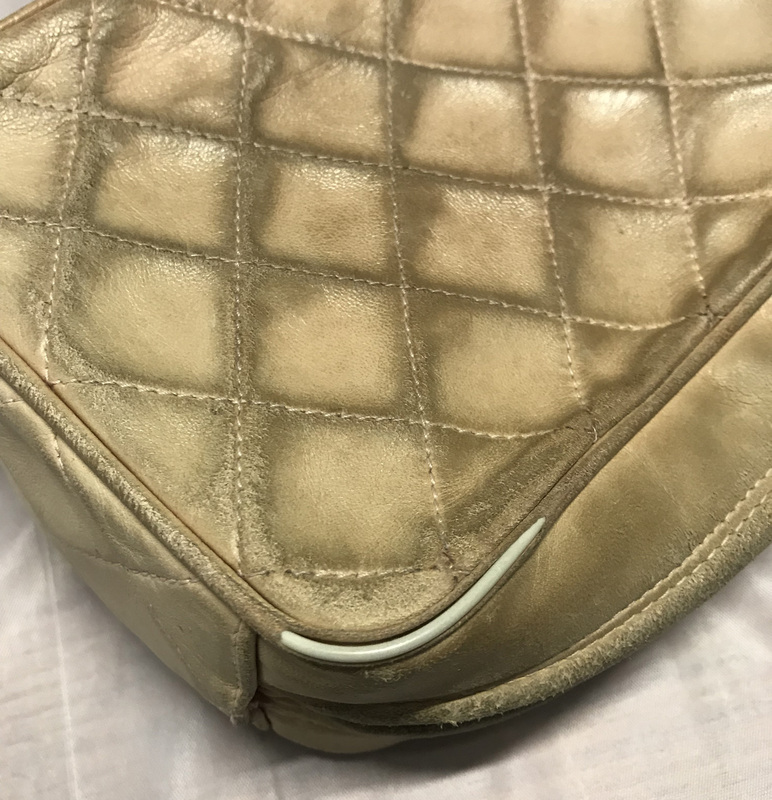 We restore many different designer brands at Bagsamoré, and absolutely love to completely transform a well loved handbag, giving it a new lease on life. Each month we select our favourite handbag transformation to give you a run through on exactly what we did and how we did it! 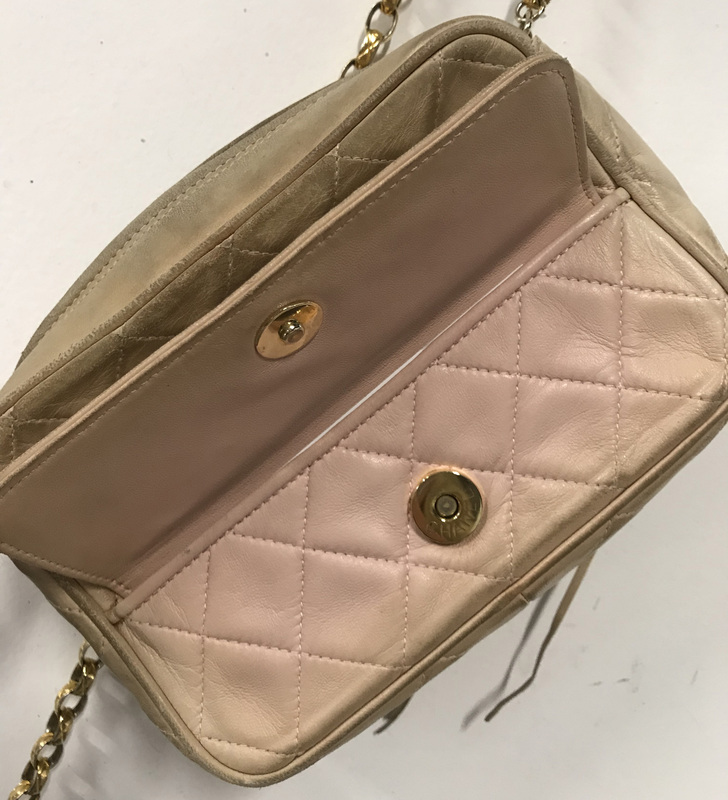 Our August handbag transformation of the month is a beautiful Vintage Chanel Camera in Baby Pink. The bag is made from a soft lambskin leather which over time can become susceptible to dirt build up, UV damage and general wear and tear. The customer contacted us for a Quote via our website with a description of the work and images of the bag. We put together the following services to get this bag back to looking its best again. 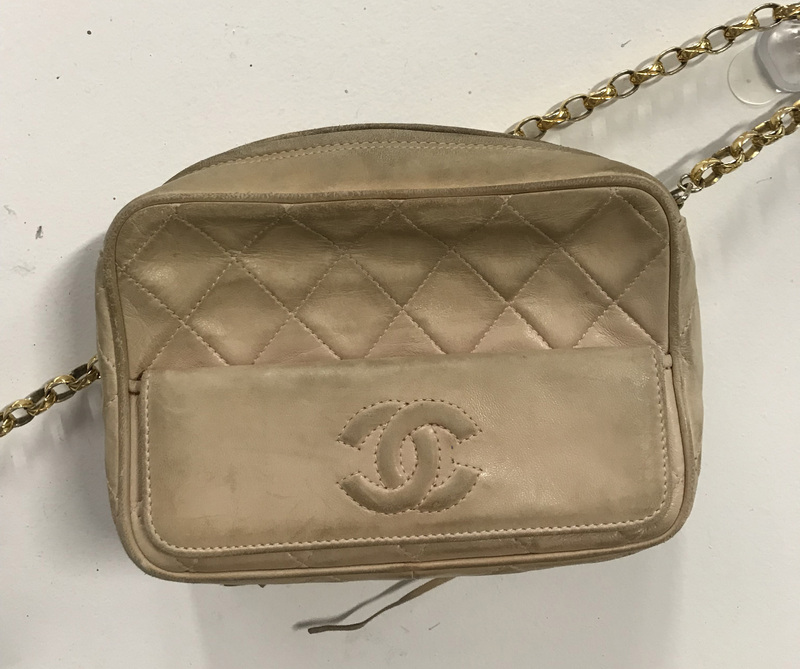 Read on to find out how we transformed this vintage Chanel with our 3 step restoration process. The first step in any restoration process is to fully clean the bag. It is important to remove any surface dirt, dye transfer or spillages on the leather prior repair and colour work to ensure the finishes bond to the leather. This also helps to create an even look and texture. Using water based cleaners specifically designed for lambskin leather we worked around the bag thoroughly cleaning its surface inside and out. The back of the bag had become especially susceptible to picking up dirt due to the high level of wear to the finish. 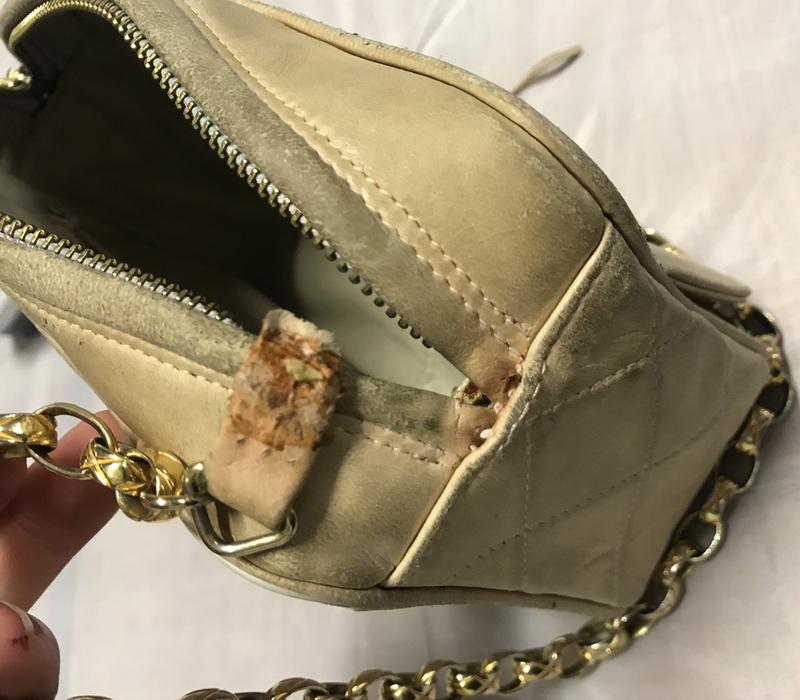 A common problem that occurs with well used bags is worn through piping. This happens on the corners of the bag, causing the plastic tubing to poke through and become exposed. In this case the leather had become so worn it had to be rebuilt using leather fillers and colour. We smoothed over the surface to blend in with the bag creating a strong new layer. The tab attached to the strap had also become loose and the stitching had come away, rendering the bag unusable. We colour matched the thread and restitched back through the existing holes ensuring a strong hold. The only evidence of the original colour of this bag was underneath its front flap, but even this was starting to fade. The bag had significant colour wear all over, including around the zip and the tassels that were attached to the zip pull. We colour matched to the original colour found underneath the flap. This is where the least amount of wear had happened. We then worked our way around the bag, colour restoring each section using air brush techniques. We also restored each individual strand on the tassel by hand so as not to affect the suede reverse. Once the colour had been evenly applied all over the bag, it was finished off with a satin sheen finish. This is an important stage in the finishing process and helps to protect the colour from wear giving the leather a soft feel and look. Finally we polished the metal work and finished with a layer of protection. This was to protect the leather from staining, dye transfer and UV damage. It also makes it easier to clean day to day dirt build up on the surface. 'Freya is SUCH an MVP. She brought my 20 year old camera bag back from the brink! She was filthy, had faded from baby pink to beige, had torn piping and the strap had popped out on one end. Now she looks better than I have ever seen, a full creamy pink has been restored. Strap is strong and in place, you cannot even tell where the piping has been repaired and a coat of protection over it all means I don’t have to worry about her now! Payment and shipping was a breeze and Freya personally corresponds every step of the way including sharing before and after photos before shipment. Can not recommend highly enough. 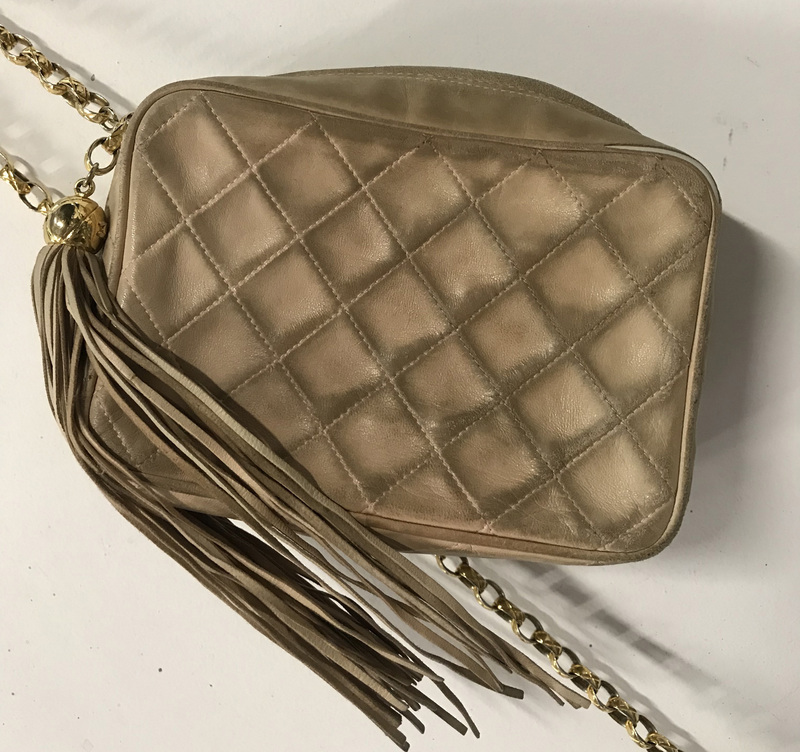 Keep an eye out on our blog for our Handbag Transformation Of The Month! It could be yours next!